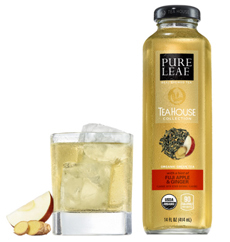 The New Pure Leaf Teahouse Collection from Pepsico. 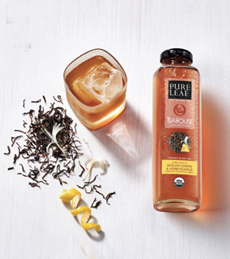 Pepsico has made iced tea more elegant with its new line of Pure Leaf bottled teas, the Tea House Collection. Debuting in select markets nationwide, the teas are certified USDA Organic—and so delicious, we can’t get enough of them! In signature glass bottles, tall and squarish, both the glass and the metal cap are 100% recyclable. The sugar is restrained—almost 50% less than most sweetened bottled teas—allowing the sophisticated flavors to shine through. Each 14-ounce bottle from the Tea House Collection has just 90 calories. There are 8 flavors of sweetened Pure Leaf teas, 2 diet flavors and 3 unsweetened flavors with zero calories—all in 18.5-ounce plastic bottles (you can find the full collection here). The brand recently introduced Unsweetened Black Tea and Unsweetened Green Tea. The Unsweeted Green Tea is really special, with a delightful undertone of honeysuckle (there’s no honeysuckle in it; the flavor comes from the particular tea leaves). Who needs sweetener?